Take a whole bunch of amazingly vital nutrients and put them into a single dish and you might get something close to this Chickpea Salad. It's chock-full of clean ingredients that boast healthy levels of vitamins and nutrients to help keep your body in tip-top shape. 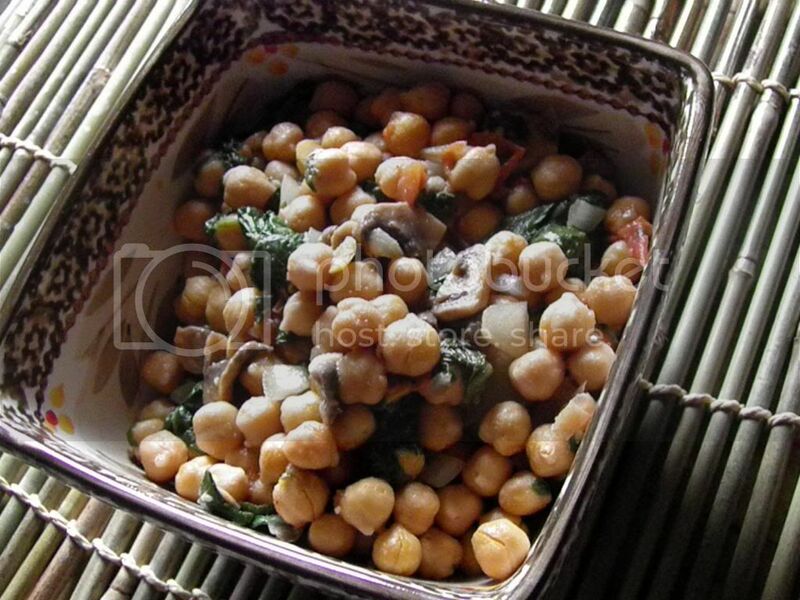 Garbanzo beans: Since chickpeas are a legume, they reduce the risk of coronary heart disease. Their high fiber content makes them aces at slowing sugar absorption, reducing cholesterol levels, keeping you feeling full, and lowering colon cancer risk. Tomatoes: Tomatoes cooked in oil are rich in lycopene, which means they provide some protection against certain cancers. Eating tomatoes with fat makes them more easily absorbed by the body. Tomatoes are also a good source of lutein, which is beneficial for the eyes in a number of ways. Not to mention all the vitamins that the red veggie offers. Onions: Onions are a potent cancer-fighting food. Onions "contain a whole pharmacy of compounds with health benefits." They are also antiinflammatory, antibiotic and antiviral in nature. Button mushrooms: They are a nutrient powerhouse. Get the book. Read page 51 and start adding these mushrooms to your daily meals. Spinach: A great source of vitamin K and calcium, which together help build strong bones. No wonder why Popeye popped those cans like a pill! It is also a great source of flavanoids, which are antiinflammatory and anticancer agents. It's great for women because of its folic acid and iron content. There are too many benefits to list! Olive Oil: The phenols in olive oil are powerful antioxidants. The oil may have a significant effect on lowering blood pressure and reducing the risk of certain cancers. Garlic: The medicinal qualities of garlic are astounding: "Garlic is lipid-lowering, antithrombotic, anti-blood coagulation, antihypertensive, antioxidant, antimicrobial, antiviral and antiparasitic. In other words, it helps lower cholesterol and triglyceride levels, helps prevent plaque, helps protect against cancer and even helps prevent the common cold. Garlic is nutritional gold. This week, I needed to make a light lunch that I could easily grab and munch on in between holiday events and preparations. I'm off of work for the holidays, which means plenty of non-nutritious foods are always within easy reach. Putting this salad within easy reach instead gives me a healthy alternative. For me, Christmas lunch is a free-for-all. Not so the rest of the week. Drizzle olive oil in a saucepan. Heat the onions, garlic and spinach over medium heat until onions start to look translucent and the spinach wilts. Add the rest of the ingredients and roast for another 5 minutes or so. Enjoy the salad, warmed or chilled, for at least another four days. Disclaimer: I am not a nutritionist or doctor, just an average person trying to eat better. I'm simply presenting information as I have researched it. Consult a professional before making any dietary changes. I love spinach too! I add it to all my meals when I can. It has so many benefits, I couldn't list them all.